Five Happy Yolks: Hi, my name is Emily and I'm an introvert. We are preparing to leave for Alaska on Sunday. I am UBER excited but I am also SO stinking nervous I feel like I could be sick at any moment. I'm nervous for the usual stuff, airplane crash, we have to fly into Anchorage and then got on a teeny plane that lands on the water *insert big gulp here* but also my nerves are coming from a place of the unknown and meeting people for the first time. 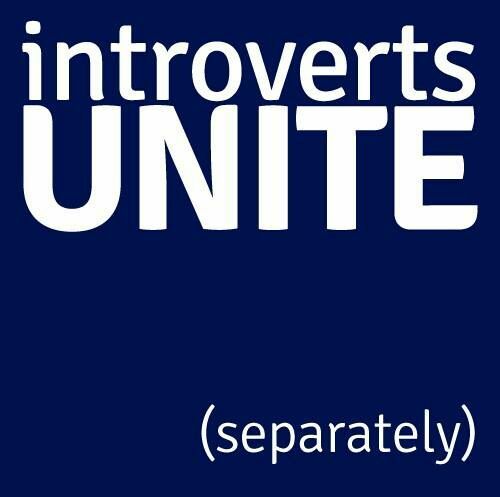 You see, I'm an introvert. A HUGE introvert. I never realized it until in my 30's, but now I see all of the signs and I embrace it. Let me explain, am I friendly, yes.. I'm not rude, I'm also not shy. I just really hate small talk, I need to prepare weeks in advance for visits, whether it be for friends of my kids or even my family (extended that is) the other people that live here that I call family, they know all about me. My grandma was a big "pop in" person, Lord help me... that makes me insane. No notice at all, let's just pop in. NO! I need notice. I don't know why I'm this way, but after being around my dad all of my life, hearing my family comment on how he never stays long anywhere, etc I now see, HE is an introvert too! He doesn't stay long because he gets his business finished and off he goes. He needs alone time. After a wedding or a weekend of photography sessions I used to wonder why I was SO exhausted, I mean really, mentally exhausted. Now I know. Being constantly "on" wears me out to the point of, I could sleep for days. If you know me in real life you would say "oh you aren't an introvert, you are always friendly and talkative" I am, but I hate small talk. 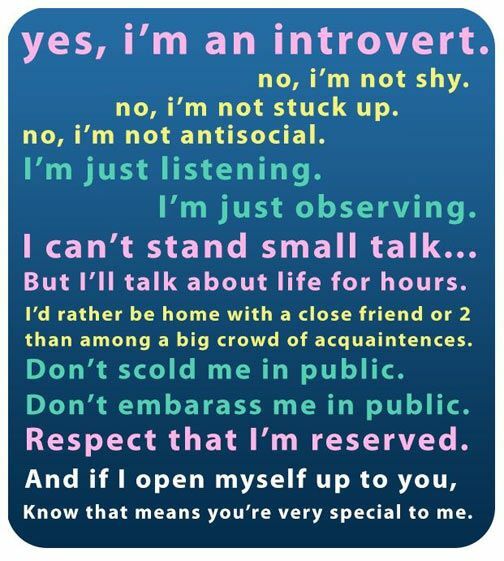 I open up to a few yes, I have some really good friends, they never do see the introverted side of me, because they know me and we talk about things, things that matter. I really hate small talk, when people can't sit in a room with you and just be. Or, for instance, my mom, she will call and really have nothing to say... and it's all small talk and then when I sit there and say "uh huh... mm hmm" she thinks there is something wrong. NO, I just can hate small talk! And again, my dad, not a huge phone talker, I used to really get frustrated after being on the phone with him, now I get it! I have a great friend and client, we are both HUGE introverts AND planners. I think the two MUST go hand in hand. We laugh about our quirks, how we both hate talking on the phone and will usually let it go to voicemail because we mentally have to prepare to talk on the phone. That is why I love texting, I can prepare! I love when I know people like me, it makes me feel SO much better about myself. So hubby and I are off to a marriage retreat, it's a part of Operation Heal Our Patriots. We will fish and hike and kayak (all things I don't do but am so excited to try) and I will put on my smile and meet people. I'll be fine, but I will also be exhausted. I will probably meet some amazing people and make some new friendships... but it will be a week of me being out of my comfort zone and probably a little on edge. But an experience of a lifetime it will be. I am going to take thousands of photos and enjoy being with my husband and being Emily instead of Gabby, Grace and Jackson's mom. I can't wait to update with a photo diary when I get back!